When the Japanese started in earnest on big capacity motorcycles in the late 1960’s, power to weight was the key; in order to go faster, make the engine more powerful and never mind the chassis that had to contain all that power. The limitations of this philosophy were firmly brought home in the 500cc Honda racers that Mike Hailwood had to wrestle around the Isle Of Man; legend has it that there was a hinge in the middle of the frame, and the bike was (non-ironically) called the Bronco. 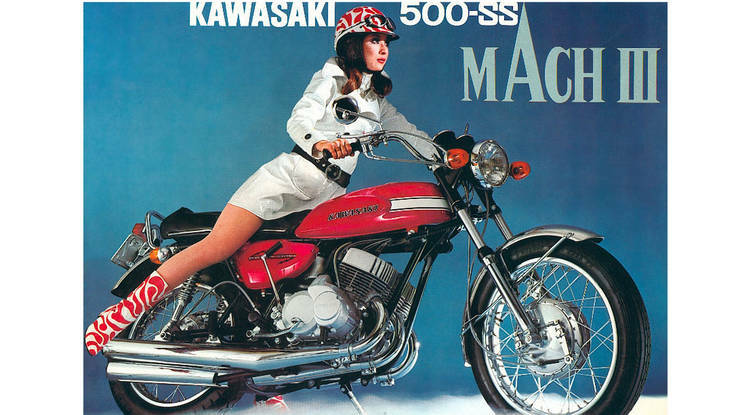 With the design of the Mach III, Kawasaki’s designers knew exactly what target they were aiming for; the American market, where all the important races took place from stop-light to stop-light. 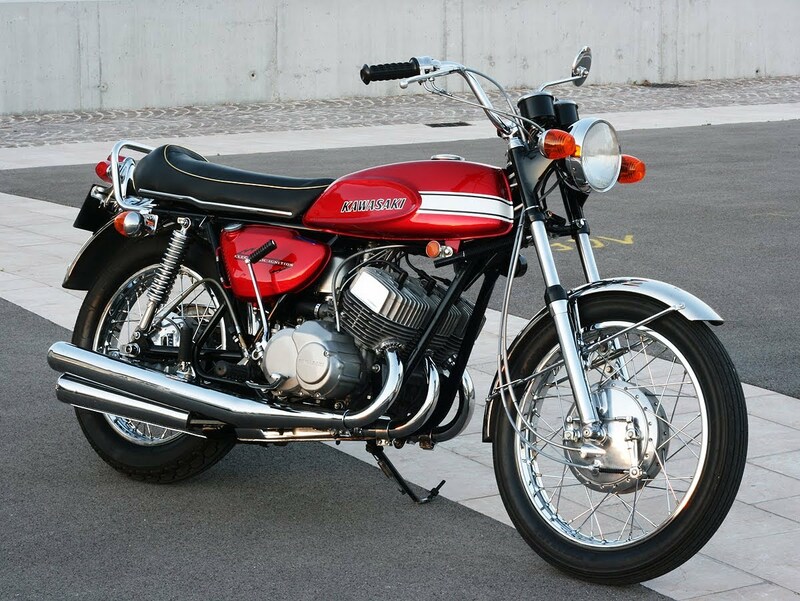 In the heyday of the American muscle car with their massive V8 engines (and equally enormous price tags and insurance bills) here was a motorcycle that could blow anything else off the road for under $1,000. How had Kawasaki managed this, and why was it so dangerous? In the first place, they had a 500cc, three-cylinder two-stroke engine developing 60hp. Next, they bolted this into a double-cradle frame with a wheelbase of only 56.3 inches (143cms), trusting that no-one would flip the thing over backwards on launching the bike down the road. Add an all-in weight of 180kgs and you might see where the trouble could start. 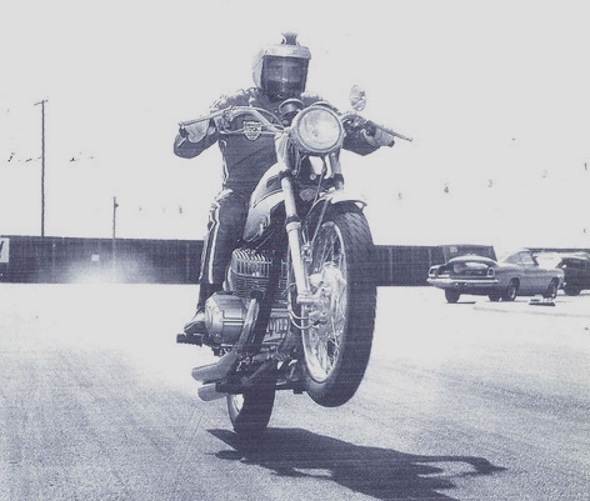 Typically for a two-stroke, nothing much happened below 5,000rpm but, between 5,000 and 8,000rpm, everything happened with a bang and the rider had to hold on and try to keep his weight well forward to keep the front wheel down. As an all-round road bike, the Mach III was pretty much useless. At normal speeds the bike handled reasonably well, but the limits of the engine went well beyond the limits of the softly-sprung suspension and the willowy chassis frame and the knowledgeable rider slowed well down for corners before opening the taps for the following straight. However, the truest measure of performance in America was how quickly you could cover 1,320 feet in a straight line and, at this, the Kawasaki was unbeatable. It may not have been the best looking bike but you bought it for one reason only; any bike that could do the standing quarter mile in around 12 seconds had everyone’s respect, no matter what it looked like. The Mach III sold like hot cakes, especially to young riders, for whom $1,000 was an easy sum to come up with. In one of the funniest epitaphs to any motorcycle’s history, common legend has it that very few of the Mach III’s original owners survived!